In this installment I talk about the formula for how I wrote this novel. A behind-the-scenes look at the parts that made up the whole. If you’re going to do something big, it really helps to begin with a dream. Writing a novel is no exception, and this one started with a literal dream. First a little back story. My wife, Aleia, has a rich dream life. Much more vivid and memorable than mine. I rarely remember my dreams in the morning, and when I do, they don’t stay with me long. Aleia often wakes up full of them and tells me her dreams before we get up. It’s the early part of the day before my brain is fully online, when reality hasn’t quite formed, when she tells me. I enjoy hearing them, but just like my own dreams, I promptly forget them. Her dreams (and mine) are nebulous cloud-like wisps that are often gone as soon as they form. One morning, I think it was early 2011, she woke up and told me her dream. She is sketching in charcoal our dear friend Wayne who died in 2004 (I’ve spoken about him here). After she is finished the drawing comes alive and Wayne talks to her. As soon as she told me about it, I said, “That would make a great story.” Maybe that was the key (linking a dream to a story possibility), but it stuck in my brain, like a seed in fertile ground. Soon the idea took root and the sketch of a plot was clear. The story would revolve around a medium named Viki Dobos who drew the dead (in pastels, a slight divergence from the dream), and helped her clients talk to their dearly departed. This is what Aleia was doing in her dream, and something we all wish we could do. That dream was the hook for the story and the hook that got me engaged. Writing a novel is scary. No doubt about it. My first novel, Shuffled Off, was something of an accident. I wasn’t trying to write a novel. I was just following the story and a novel is what happened. 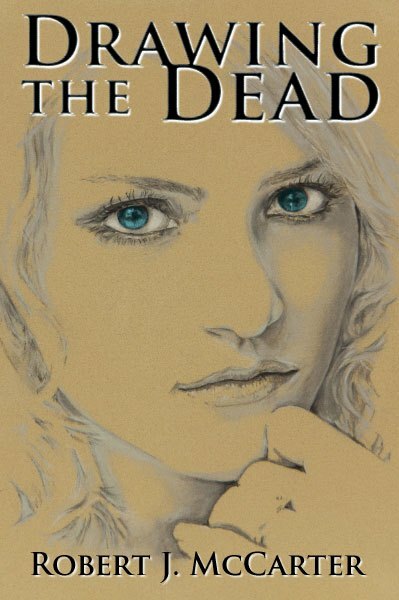 When I first conceived of Drawing the Dead, I didn’t think it was going to be a novel. I was absolutely sure it would be about 30,000 words (around 150 pages) making it what is called a “novella.” So, in my mind this wasn’t a novel I was writing, so not scary yet. But the scary part was there…. A female protagonist. You see when stories come to me, I don’t argue with them. Changing Viki into a male character to suit my comfort level, would have been a disaster. Following the story as it came to me… well, that’s all I can do. Ursula Le Guin has a wonderful collection of essays on writing called The Language of the Night. This is the book that got me back to writing at the end of 2008. In it she talks about the writer delving deep into the collective unconscious and coming back with stories. More like a discovery than a creation. It has always been this way for me. The stories and characters lead, I follow. So a female protagonist it would be. Scary, but as it turns out in art, scary is good. Scary means you are trying something new, stretching yourself, growing. I (again) didn’t want to write a novel. Writing them is a long and arduous journey and takes a lot to bring to form. But, my process is to follow the characters, and that is what I did. There are two different styles of writing that are on opposite ends of the spectrum. One is the “discovery writer,” that sits down and does it by the seat of their pants. The other is the “outliner,” that plans each scene before writing a word. So what happened to the novella that turned it into a novel? The characters took over and that 30,000 words turned into 63,000 words. I remember right when it happened (sorry, not going to mention it, no spoilers), and it is the best feeling. I had characters, I knew who they were, but imagine what it feels like when they start doing things you didn’t plan. When they take over the narrative and complicate your story (and make it better). Honestly this has happened with every novel I’ve written (there’s a third one coming later this year) and it is really my favorite part of writing. Stephen King talks about this in his book, On Writing. He says (and it’s been a while since I read it, so this is paraphrased) that he wants to be surprised as a writer, and believes if he is surprised, his audience will be too. It’s kind of like writing like you’re a reader. You’re on the journey too, not exactly sure what is going to happen. Drawing the Dead is a product of this formula. Interested? Read the first few chapters right now. Read about my inspiration for this book in the second part of the series.